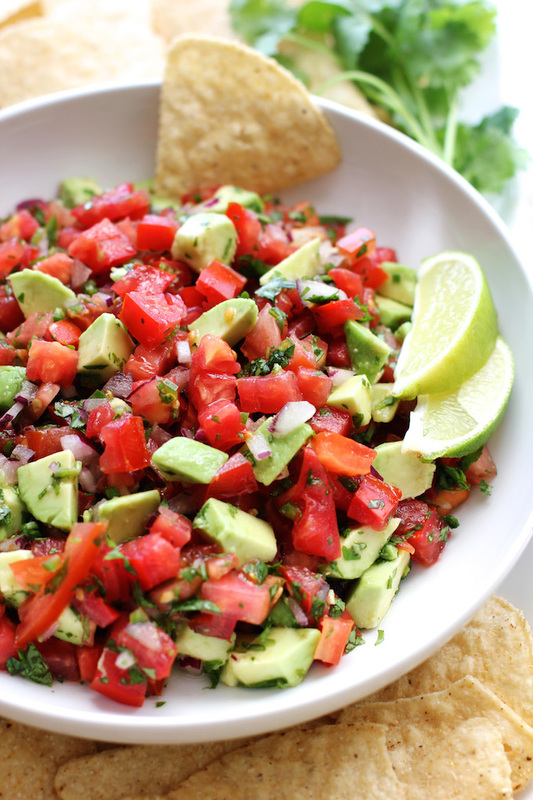 A fresh, easy tomato avocado salsa. The perfect appetizer to share with friends whether hanging out, having a party or watching the game. Quick to make and packed with flavor! This tomato avocado salsa is super simple to whip up. It’s fresh, zesty and loaded with ripe tomatoes and creamy avocado. The perfect appetizer for a party, game day or just hanging with friends. This is a healthy choice for a dip. It’s loaded with fresh flavor and healthy fats. And its got lots of avocado in it and who doesn’t love avocado. Just chop up some tomatoes, avocado, jalapeño and red onion and then toss with a lime dressing and some cilantro. Set aside for at least 15 minutes so the flavors can blend and you’re ready to go. I’m all about the cilantro and lime flavor in this salsa. I love the fresh zingy taste of lime and cilantro. This salsa is not very spicy – since I’m a bit of a heat wimp – I only used a half of a jalapeño pepper. If you want a hotter salsa then use the whole jalapeño. Add some to a quesadilla, burrito or tacos. Toss it with rice and beans to rev up a burrito bowl. Add it to an omelet for a zesty kick. Or just eat it by the spoonful as I did when I was testing this recipe. 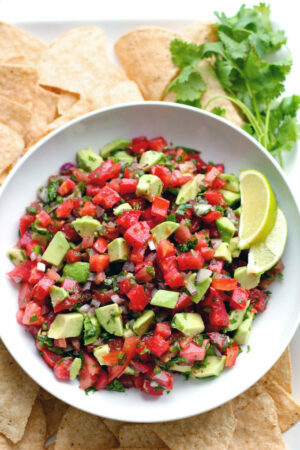 A fresh, easy tomato avocado salsa. The perfect appetizer to share when watching the game, having a party or just hanging out with friends. 1/3 cup red onion, finely diced. 1/2 jalapeño pepper – finely minced – use more if you like your salsa spicy! 1 ripe avocado, removed from peel and diced. Dice tomatoes and put in a fine meshed strainer to drain as you prep the rest of the ingredients. Dice red onion and place in a little bowl of water to reduce the raw onion taste. Cut jalapeño pepper in half and remove seeds and membrane. Finely mince the jalapeño. I only used half of the jalapeño since I don’t like my salsa too spicy. Use the whole pepper or more if you like your salsa hot and spicy. Mix lime juice, olive oil and salt together in a small bowl. Add drained tomatoes to a medium sized bowl. Drain red onion from water in a fine meshed strainer and add to the bowl. Add jalapeño pepper, avocado and cilantro to the bowl. Pour lime dressing over tomato avocado salsa and toss gently. Jalapeño peppers are HOT. Be careful not to touch your face or eyes when handling the jalapeño pepper since it will burn. Wash your hands after dicing them. I removed the seeds and membrane since I don’t like a really spicy salsa. If you want more heat then use a whole jalapeño or two. This is such a colorful and healthy recipe packed with nutrients! Pitch perfect and immune boosting! Thanks, Liora – definitely a great side – that’s if you don’t eat it all with chips :)! Thanks for stopping by and leaving a comment. 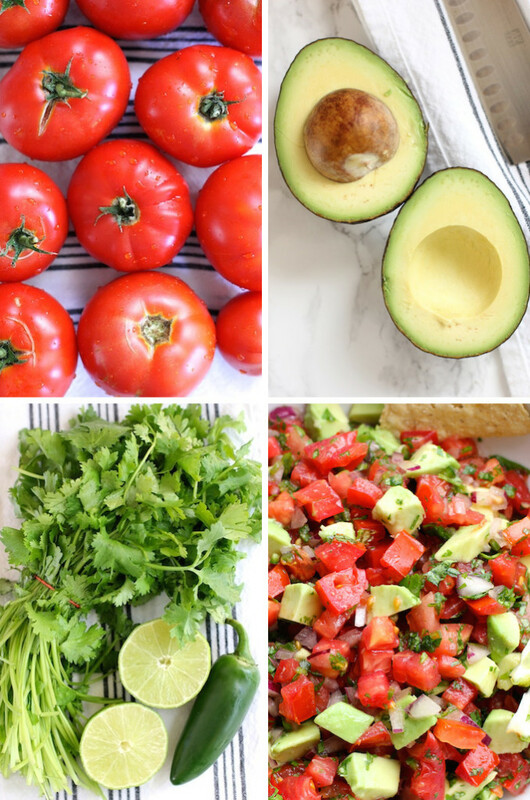 Geraldine, this is another recipe that seems like it was made for me 😉 I love all those fresh ingredients, especially the tomatoes, avocados and of course cilantro. I’m so happy that I love cilantro. I actually pity those who hate it. Thank you so much for this recipe! Thanks, Lynn – I’m with you on cilantro – I can’t believe that people don’t like it. I love the smell and taste of cilantro – so fresh and bright! Thanks, Denise. This was one of the recipes that was hard to photograph because I wanted to eat some right away :). Hi Fareeha – thanks for stopping by and leaving such a nice comment! Hope you have a great weekend. Thank for such a great compliment, Kathryn! I agree, salsa is pretty hard to resist – especially if there’s avocado involved! There was actually a day when I would not get near avocado with a ten foot pole. Could not eat it. 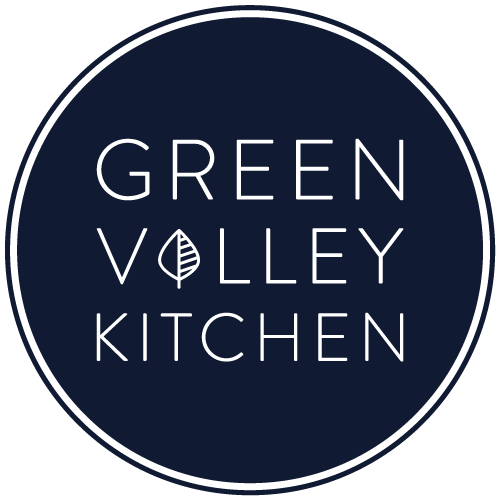 And then my oldest daughter finally turned me on with her delicious take on guacamole – and now – there’s no turning back! This salsa is so fresh and scrumptious…right up our alley – especially now that it’s tailgate season! Love it, Geraldine! Thanks, for sharing, my friend! Ahh, Annie – I’m glad you’re realized the beauty of avocado! Try it on some toast sometime – it’s the best. Geraldine this salsa looks gorgeous! I have to say, as old as I am, I tried avocado for the first time last year! What I’ve been missing! Now I eat it all the time, and on everything. This looks fresh and delicious, and I’m looking forward to trying it. Thanks for sharing. Thanks, Mary Ann! I didn’t eat avocado that much until a few years ago. Now I have it almost every morning on toast – love it. I could eat this for daaaaysss, Geraldine! The lime and cilantro.. I think adds so much to this salsa. Cilantro especially because it ads such a fresh balance to the tomatoes. I’m already looking forward to tomato season next year. I’m not ready to see them go! Delicious recipe my dear! Thanks, Traci. Definitely the lime and cilantro make this dish (and the avocado too)!